The medieval cosmos was finite and bounded with the Earth at the centre and the stars fixed to a celestial sphere. Archimedes estimated the size of the universe to be 1014 stadia in diameter (about 2 light years). Jewish and Christian models of cosmology were broadly in line with the Earth at the centre of the universe orbited by the other planets and the Sun with the fixed stars beyond this. It must be admitted that the Jewish and Christian models do have the planets in a slightly different order but the overall concept is the same. 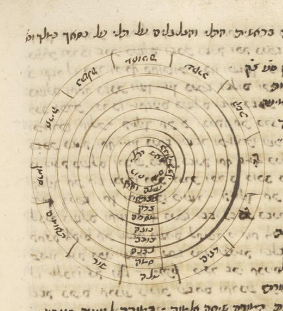 The Jewish model is found in many medieval manuscripts including JTS 1895, Harley 510, Hebrew University MS 7 and the 1562 edition of Sefer Yetsirah Ha-Shalem printed in Mantua. Some models of the cosmos have a layer of water beyond the fixed stars or ice beyond the fixed stars or a sphere of water ice orbiting the sun beyond the solar system (See Oxford St John's College MS 17). To the Earth bound observer this is reasonable. The night sky appears to be the inside of a celestial sphere. The cosmos is ordered and logical. In the play Trollius and Cresida the character Ulysses makes a very interesting speech about the cosmos in Act 1 Scene 3 which is rather ambivalent. At first glance it seems to confirm the Terracentric view of the cosmos but on closer inspection it seems that Shakespeare was hedging his bets so as not to confuse anyone. And, hark, what discord follows! each thing meets"
Each of the planets is mounted on a transparent sphere which lets the light through. The distances between the planets are fixed according to Pythagoras as musical intervals thus the planets make harmonious music as they pass across the night sky. There is celestial order and harmony in the medieval cosmos. The seven musical notes are also the seven colours of the rainbow. 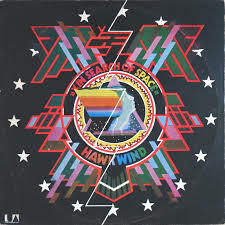 In 1970 the graphic artist Barney Bubbles utilised this concept of the seven light rays to design the cover for Hawkwind's album X In Search of Space. I bought this as a teenager when it came out and still listen to it. Shakespeare in Ulysses speech does not define "this centre". It could be the Earth, it could be the Sun. Shakespeare was being deliberately vague. The Copernican Sun centred model was growing in popularity in 1602 when Shakespeare wrote this play but to publicly endorse it would have lead to criticism from the Church and a possible loss of patronage. Better to play safe and be ambiguous with such matters.